Over the bar, originally uploaded by The Bacher Family. 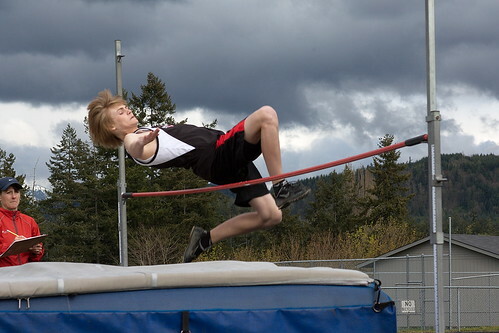 One of my favorite images from David's May 5 track meet is this one of one of his teammates "crossing the bar" on the high jump, with dark rain clouds brooding in the background. I love the dramatic lighting and the caught-in-the-moment action, with the athlete suspended in mid-air and mid-concentration. My EOS XSi does really well with pictures like this on its "sports" setting, tracking the motion almost flawlessly and choosing a fast shutter speed to stop the action. Its only shortcoming is a relatively slow frames-per-second rate, leaving it up to the photographer to catch the right moment to trigger the shutter.